Double Hung Windows add modern design and durability to your house. 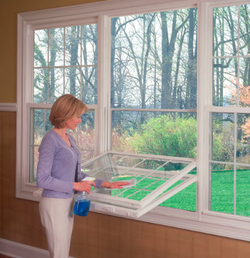 The tilt-in sashes of double hung windows make cleaning easy and worry free. Unique thermal construction and high quality materials reduce your heating and cooling bills. These windows can be made in custom colors. There are several true vinyl extrusion colors and then about any custom pre-painted colors. All of the locks of the double hung windows are customizable as well. They are made in different shape and color. When you want a clean look of the window sashes you can eliminate lift rails or customize them as well. The Basic color is Euro White, that's the most popular color. Almond and cocoa are pretty much widespread colors as well. Double Hung windows available in these three color vinyl extrusions. It means that the frame of the window is not painted, but the color is in the vinyl of the frame. The exterior of the double hung window can be done in seven colors. Euro White, Almond, Cocoa are true vinyl colors and four are painted. It is possible to make any color, which is a special order. As always whatever is special it comes at an extra fee. Double Hung windows not only a pleasure to use, but a pleasure to clean. Both sashes of the window are easily tilt inside the house for easy cleaning. Double Hung Windows can be easily customized with different grid patterns. You have the option to have different types of decorative grids. The most popular style is Colonial Grids. You can do both sashes with grids or just the top sash. Same thing with Diamond Grids, Prairie Grids or Perimeter Grids. All of the decorative grids are installed between the two glass panes. It means they are going to be dust free and maintenance free. Just take into account that grids add to the total price of the window by $15-$30.